Padiham are being made to wait patiently for their first triumph of the campaign. 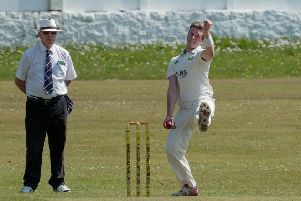 Callum Clarke’s side have already lost to Euxton and Brinscall in the Ribblesdale Cricket League this term while fixtures against Great Harwood and Edenfield have been abandoned. Saturday’s league clash at Gincroft Lane fell victim to the inclement weather conditions and 24 hours later the Arbories outfit were dumped out of the Ramsbottom Cup in the second round. At School Lane, Brinscall professional Lehann Jansen van Rensburg educated the away side in the art of batting. Just weeks after firing 134 runs and claiming five wickets on Padiham’s own turf, the South African struck again. On an uncompromising track, having already clocked up three wickets in limiting Padiham to a 106-run total, the paid man manufactured a classy knock of 33 from 103 deliveries to earn a seven-wicket win. Owen Deakin-Pickard top-scored for the away side with 29 while Brannon Varley was second best with 19. But van Rensburg’s pairing with Sam MacLachlan (27) and Stuart Parker (17 not out) eased the hosts over the line. He added: The pitch at Brinscall was poor too. We played 90 overs between us and there were only 200 runs scored which tells you everything you need to know. “We just didn’t graft on it like their pro did. It was the same person that batted well against us the other week but he showed a different side to his game this time. “He was really good. He bowled well and had to adapt to the conditions because his pace didn’t benefit from the track. “He just used all his experience to bat through and he showed that he can do it both ways. That’s obviously great for Brinscall but it’s bad for us. Elsewhere, rivals Read suffered a similar fate as they crashed out of the cup competition at the expense of Settle. The visitors set a high standard at Whalley Road on Sunday when totalling 299-8. Paid man Imran Khalid struck with a devastating knock of 114 and he was assisted by Keegan Petersen (62) and Robbie Davidson who contributed with 55 runs. In reply, Will Davidson tore through the home side’s batting attack as he claimed 6-25 to extinguish Read’s hopes of progressing. Kyle O’Connor’s side fell 170 runs short. It proved to be a disappointing and underwhelming conclusion to the weekend for Read after they had ended Earby’s bright start to the season just 24 hours previous. Joey Marshall’s 63 in a 227-9 total earned a 13-run victory.